Despite weeks of rainy weather, it began getting sunnier and warmer as the big day approached, and the 14th was a beautiful day: sunny, with a hint of a breeze to keep competitors cool. 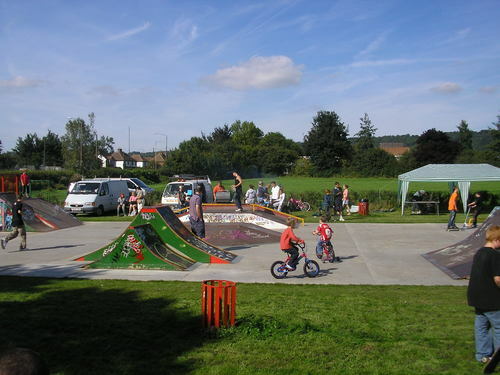 We had a good crowd of skaters and families, and the food sold out in short order, but a lot of boarders were brutally honest about their chances and declined to spend £2.50 they knew they would lose. The comp was organised by Wrotham Fireworks Committee and Parish Council to say thank you to young people in the Village, and a survey is under weigh to organise a trip out in the near future, contact Mike for details. Winner of the Under 16s was Pete Cumbers of Borough Green. 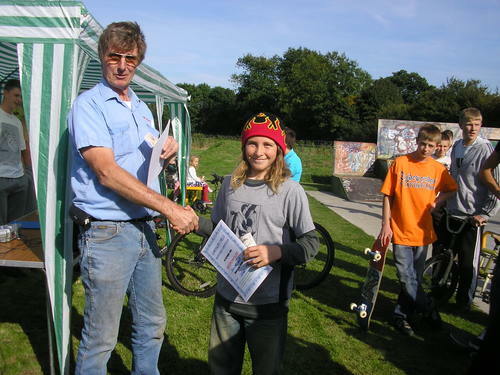 This is Daniel Hart accepting his prize and certificate as Under 16s runner-up. Talk about dedication, he had come all the way from New Zealand to take part! Some of the audience, from the Borough Green Drop-in Centre: Aiden, Chippy, Jade, George, Derek and Keiron. 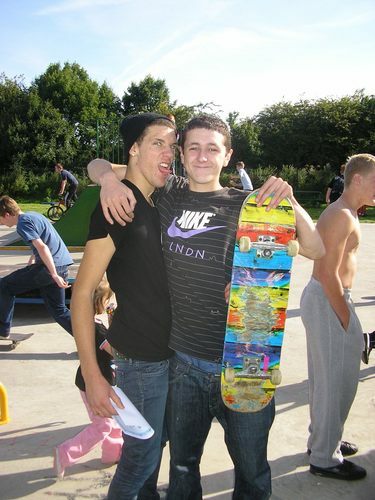 Jimmy Ashby won the over 16s, with the best run he has ever made, everything went right for once. 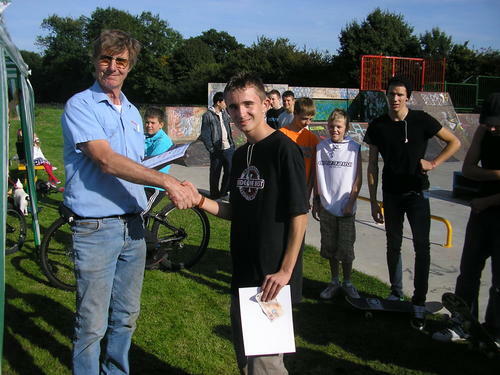 Jimmy was the Judges ( and boarders) choice as overall winner for his sheer hard work, dedication , and oblivion to pain. Jimmy seems to be at the park the whole time, usually sitting on his backside cursing quietly after stacking it yet again, still, it paid off, Jim, Well Done!! Tony, welllll ! If he'd got an early night, instead of carousing 'til 6 in the morning, he might have showed us what a good boarder he is, but he kept dozing off in mid air : Tony the Dormouse !!! Still good enough to be runner up though. Scott Stevenson would normally be top of the line, but even the best have off days, and this was his: only just arrived in time to compete, pyjama leg sticking out of the bottom of his jeans: the rest of the world is up and about long before 1pm, Scott. Still a terrific display of skill, even if his deck kept wandering off on its own! Thanks to Scott and Jimmy for their help behind the Scenes, and to Burger as the Chief Judge. Our Thanks as well to the cooks, Stuart Vick from Wrotham Fireworks, Kieron Denton from Wrotham PC, and Fran Ashby and Nick Waller from the Borough Green Drop-in Centre. Our Further gratitude to Plaxtol Bakery and Copus Butchers for the deals on food. Whilst Wrotham has had terrible problems in the past, the change over the last year has been dramatic. 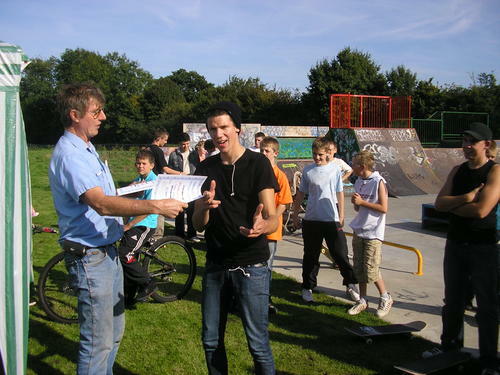 This is due to a number of factors: better liaison between Police and Russet Homes, The Parish Council's youth initiatives such as the Youth Shelter, graffiti boards, the Skatepark, but credit must also go to the young people for their efforts to change, and this comp was part of the reward, the benefit for being a part of the community, rather than a problem to the community.